Long after the summer grasses of California turn golden in the valleys and foothills, spring is in full bloom in the High Sierra. Here on the highest peaks above 10,000 feet, flowers of fantastic color and abundance can be found all through July and into August as they take advantage of warm days and melting snow. 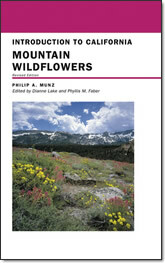 This ranks as one of California’s foremost wildflower displays and lucky are the mountaineers willing to ascend into the lofty realms of bare granite and thin air. The rare and widely scattered Sky Pilot (Polemonium eximium) blooms here in dense balls of purple-blue flowers heavy with a potent skunky smell, which attracts pollinators. John Muir’s favorite flower, Mountain Pride (Penstemon newberryi), carpets granite slopes with brilliant pink flowers for only a couple weeks. And Alpine Gold (Hulsea algida) stands out like a dazzling fragment of yellow sunshine along the Sierra crest. I was lucky enough one July day to hike onto the slopes of Mt. Gibbs in Yosemite National Park during an afternoon thunderstorm. Despite the heavy dark sky and gloomy prospects, I wanted to see the wildflowers on the only day I had free so I pushed myself up to the upper treeline. All effort was rewarded when the setting sun dipped below the lid of storm clouds and shot across the rain drenched slopes with dazzling brilliance. Every flower sparkled with radiant color and the effect was breathtaking. But the alpine floral show contains many more discoveries than just flamboyant wildflowers. In the zone of wind and piercing cold found above treeline, all plants adapt by scrunching down close to the ground where botanists have to crawl around on their bellies with hand lenses to fully appreciate the diversity of life. This is especially true on the Dana Plateau, one of the Sierra Nevada’s most famous nunataks, high rocky areas that remained ice free during the Pleistocene glaciation. On this single plateau the species diversity is so high that roughly half of all the alpine plants found in the Sierra Nevada can be found in a single location. And all of these plants are mere centimeters tall, forming a mat so dense that it’s hard to pick out separate species. It takes a practiced eye to spot the minute Ivesias (Ivesia shockleyi) or the marvelously tiny Snow Willows (Salix reticulata), but it’s nearly impossible to miss the Red Mountain Heathers (Phyllodoce breweri) and Alpine Shooting Stars (Dodecatheon alpinum) in their midst. No matter where you hike in the High Sierra during the summer, some part of this fantastic floral show can be seen as you hike among the rocky boulders and scattered lush meadows. It is a wonderful reminder of California’s remarkable diversity that life can be so rich on the highest peaks in the state.